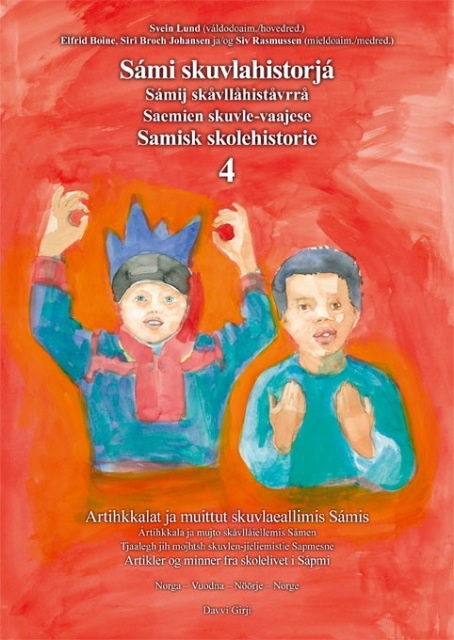 Sámi skuvlahistorjá / Samisk skolehistorie (Sami School History) is a series of books published by the publishing house Davvi Girji. 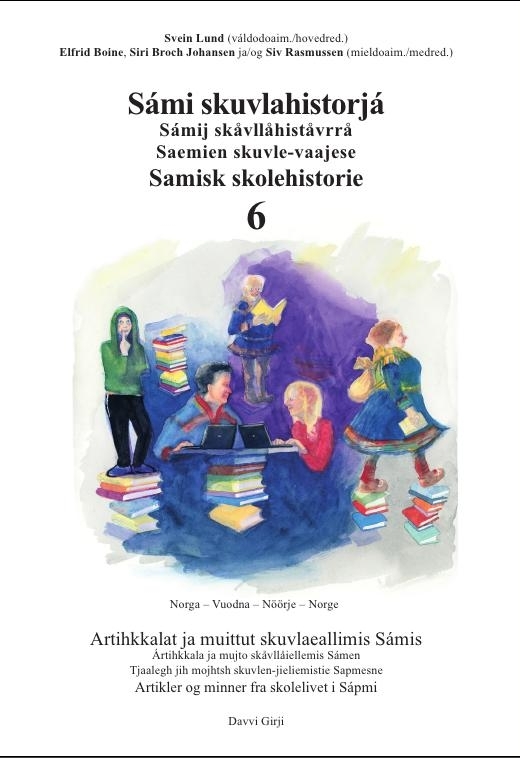 In about 240 articles in 6 volumes there is told about the experiences of Sami children in Norwegian schools, and about the changes in the educational politics of the Norwegian authorities towards the Sami population. The books are published with parallell text in Sami and Norwegian language. In this web site some of the articles of the first book are also published in English. It would be too much to translate it all, so to make this history available to a greater public, we are translating a series of newspaper articles, which sorted by topics make a summary of stories in the books. 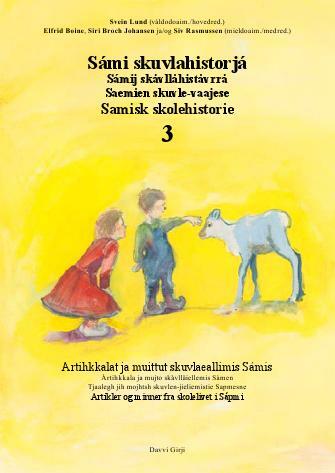 So far there are 29 articles published in Sami language by the Sami newspapers Min Áigi and Ávvir. They are also published here in Norwegian and English. Articles 30-36 will be published here gradually as they are printed and other language versions gradually as they are translated. 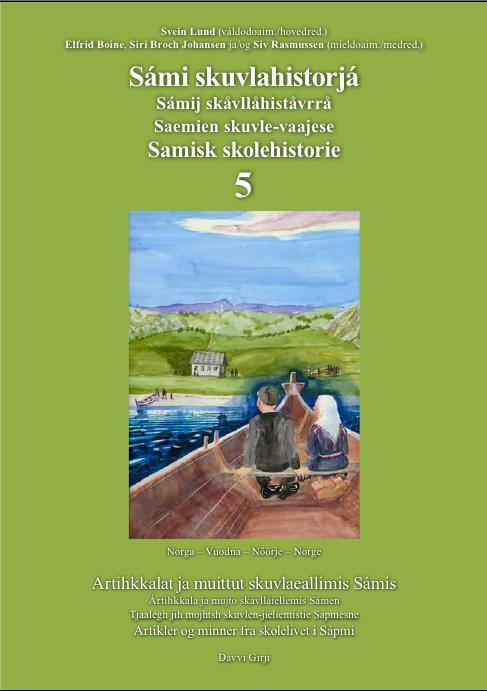 Sami school history is a very special part of the history of Norway and of the Nordic countries. 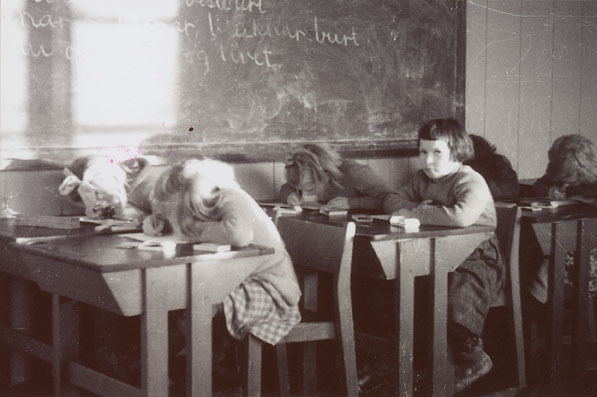 School has, for centuries, been the authorities’ instrument for making the Sami into Christians and Norwegians. School has often been conducted in such a way that one would have to call it a crime and many have suffered in very many ways because of Norwegian schools. Though much has been written about how the authorities’ policy have changed throughout the years, little has been written about how school has really been and about what pupils, teachers, parents and boarding-school employees have experienced. 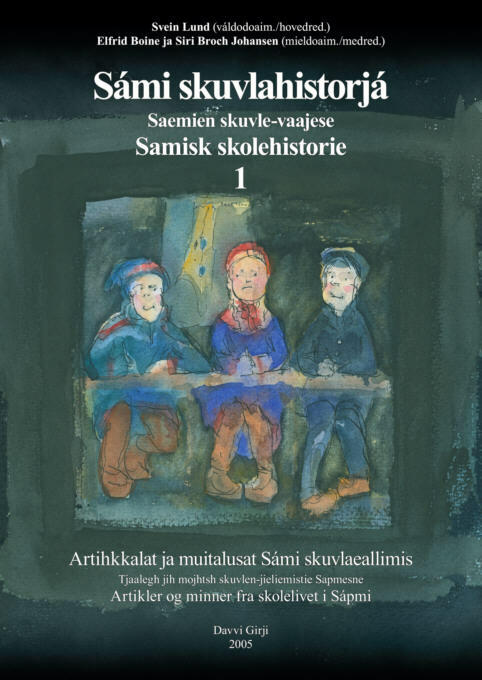 Little has also been written about the opposition to the authorities’ school-policy or about the struggle that, in the end, led to the Sami language and culture being given its place in school. 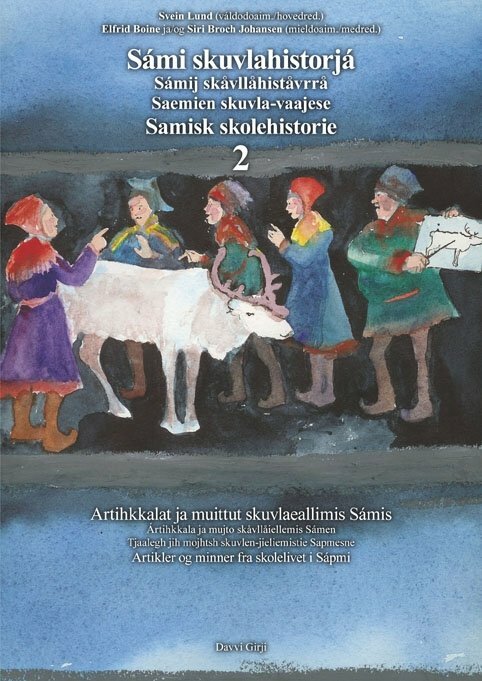 In my own encounters with Sami schools, as a pupil, student and teacher, I discovered how little was known about Sami school-history, both among pupils and teachers, and I myself have experienced how difficult it can be to find information. Then I started to ask why and discovered a possible reason for this; school was so traumatic for many that they have not been able to talk about it. 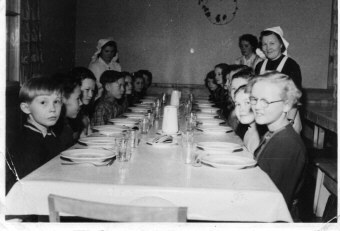 (Photo: Sigrid Bergli Sørnes) Schoolchildren in Sirma in the early 1950s. "In school we are progressing rather slowly, but at least there is progress. Poor children who do not have teachers who speak their own language. 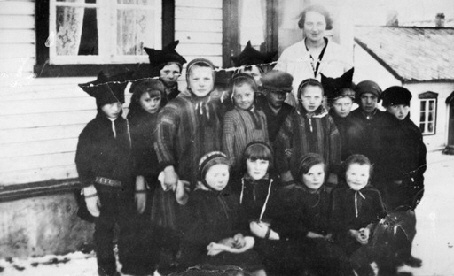 It is a crime against them..."
The Sami’s bad experiences at school may also be one of the reasons that they who have, until now, written most about Sami school-history are people from another background, who have themselves not suffered because of a linguistically and culturally foreign school. I also belong to that group, and I had had 13 years schooling in my own mother-tongue before I arrived in Samiland and saw how much worse the conditions had been for Sami of my age, who had attended a school where their mother-tongue was forbidden. When I started studying educational science, I was interested to find out more about this history, about what had happened and why, and how school had affected pupils, teachers and the community. I sought others with the same interest, and together with a couple of former Sami teachers, we formed an editing committee and started collecting stories that will, in time, come out in book-form. 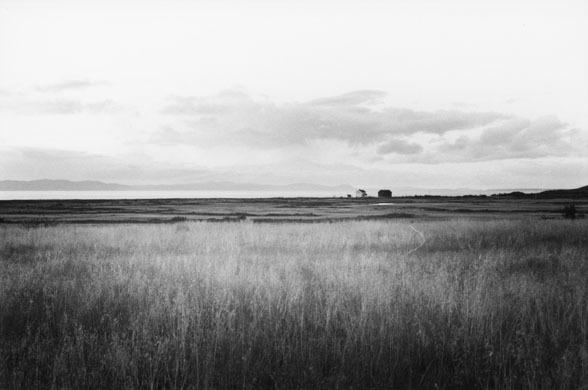 This time, we bring you a complete story from Porsanger, with the late Hans Hansen as narrator. He told his story to Hanna Hansen, who has written it down in the form of a poem. The story of Hans Hansen’s schooldays. 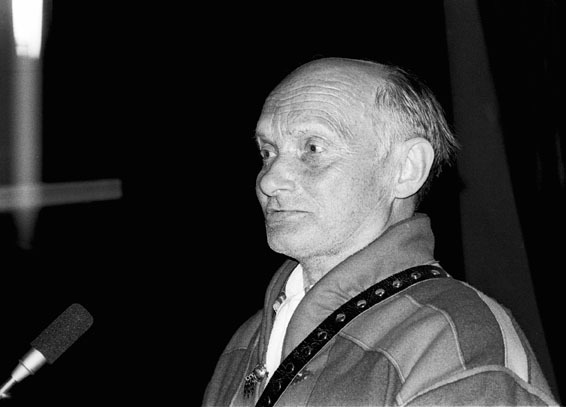 Hans Hansen as a representative at a national conference for “Norske Samers Riksforbund” (Norwegian Sami Association), Kåfjord 1986. Most of us were in those days. We received the bible history and catechism to bring home – in Norwegian. I had heard the bailiff and the tax collector speak Norwegian. before I started in school. We learnt twenty-nine letters from the Norwegian alphabet. To put letters together into words was difficult. We wrote with slate pencils on stone boards. Spat on the board and erased it with the costume sleeve. We did not understand what we wrote. Read many books – Norwegian books on geography and natural science. We understood the teacher’s questions, but could not answer. Could not speak or explain. Some children did not understand anything. Had to stand during the whole lesson. The teacher spoke Sami to explain to me. even if I did not understand the language. Ninety-two weeks I had attended school. In forty-six of those weeks I did not understand much of what the teacher said. Additional education was for the few. Some started at school of agriculture and some started at folk high school. The rest of us continued our lives as before. What we carried with us from school was feelings of inferiority. Everywhere in society they spoke Norwegian. It was difficult for us. We could not express ourselves. At the same time we had to obey authority that spoke with us in Norwegian. They told us to be objective and self-controlled. It was not easy to understand the meaning of that. Gradually I understood that they were asking from us what they were lacking themselves: impartiality and self-control. From that moment I did not feel inferior anymore. They can hold positions, military grades and stars. That does not make a difference to me. I speak to people, not to positions or stars. 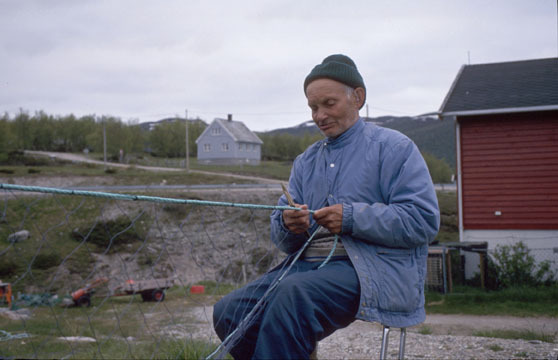 Hans Hansen is mending nets. People down south are not the worst. The worst are among our own. Many came from other places. a solution for those who spoke a little Norwegian. In that way they got into better positions. I have never tried to hide myself. Have had no brains for that. Those who cut their own roots do not grow anymore.